Welcome to La Cantina Restaurant... Fantastic Italian Specialities, Delicious Homemade Pizza, Superb Wine List. Parties Catered for...Great for Families! We can cater for your party - small or large, whether its for the family or for the office night out. 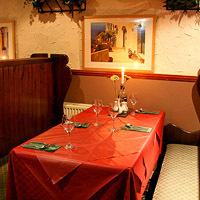 La Cantina, situated downstairs to 51st State is Dunoon’s only authentic Italian Restaurant. We offer a relaxed & informal setting for that “Special Occasion”, or simply for a “Great Night Out”. Open 7 days from 5.30pm until 10pm. Please have a look around our website where you'll find, menu's, galleries, events, and a reservation booking form. The 51st State & La Cantina The 51st State & La Cantina is feeling happy.